Ester Contreras is an attractive young lady who was married to the late Cpl. Leonardo Contreras. In the year 2008 they were living on base at Camp Pendleton and were blessed with the recent arrival of a baby girl. Leonardo was, by nature, an outgoing, amiable young man and had a positive outlook on life. However, after two tours in Iraq, he returned to Ester and his daughter a changed man. He was sullen and depressed. 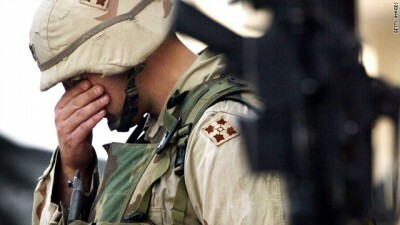 He had witnessed combat and couldn’t remove the war that waged in his mind. Cpl. Contreras was in all probability suffering from Post Traumatic Stresses Disorder, also known as PTSD. One evening, Ester woke up because she could not breathe. Two very strong hands were wrapped around her throat in a death like vise grip. Ester, with all the strength she had, removed a few fingers and let out a scream. Leonardo fell back onto his pillow and cried out for help. Ester and Leonardo had a long conversation and she convinced him to seek psychiatric treatment. Leonardo quickly agreed for you see he had attempted suicide and feared that he might kill his wife, his daughter and himself. In the middle of the night they drove to the Balboa Navel Hospital in San Diego. Leonardo told them that he attempted to strangle his wife and had also attempted suicide. By law, the hospital had to report the incident to the sheriff’s office and that is exactly what they did. The Sheriff arrested Leonardo and put him in jail. A few days later his jail keepers found him dead in his cell. He hung himself. . Ester felt that Balboa hospital had failed Leonardo and her family. I’m sure that she often thinks that if he got the proper medical help he would be with her today. At the risk of sounding judgmental about what people or organizations should or should not do, may I suggest that, perhaps, if the personnel at the hospital had asked a couple of probing questions they might have learned that Leonardo was waging a private battle in his mind brought on by witnessing some horrific events totally out of the realm of normal human behavior and brought on by his two tours of duty in Iraq. Post Traumatic Stress Disorder (PTSD) left untreated can result in drug abuse, suicide, marital problems unemployment and in some cases criminal behavior. May I count on you to call your congress people and senators to ask that they consider more funding and encourage the Department of Veteran Affairs to work on reducing the amount of bureaucracy so that we can do a better job of supporting our returning military personnel. Thanks for you help on this most important issue.